The series of maps associated with restrictions on multi-family zoning, minimum lot size requirements, and age restricted housing is one way to illustrate the relationship between local land use regulations (specifically multifamily zoning laws) and areas of opportunity. This map looks at towns that outlaw multifamily zoning entirely. Eleeven towns were identified and are shown above in dark gray. They include: Littleton, Nahant, Sudbury, Norwell, Medway, Hanover, Norfolk, West Bridgewater, Bridgewater, Carver, and Lakeville. All of these towns are in high opportunity areas. 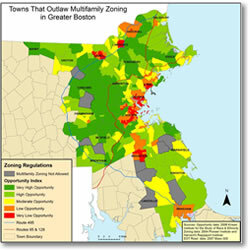 Most municipalities in greater Boston allow multi-family zoning on only a small percentage of their land. Remaining communities represent less than 30% of the total. In addition, approximately 10% of the municipalities in greater Boston prohibit multi-family housing developments outright or restrict it to allow only developments for occupants 55 years or older. Those municipalities that technically allow multi-family often regulate it so tightly through difficult special permitting processes, large parcel size zoning, or large lot area per-dwelling unit requirements that it often becomes infeasible to build. Why do municipalities regulate multifamily housing so tightly? One of the primary reasons why towns regulate multi-family housing so tightly is the fear that such housing will increase the demand for schools and other public services without generating sufficient tax revenue to offset the costs. Property taxes are the largest source of local tax revenue and the tax base in most suburban towns is made up of almost entirely residential property. Existing homeowners may fear that multifamily housing will result in lower property values. How does restricting multifamily development impact segregation? Such a strong emphasis on lower density, single-family housing has an implicit discriminatory affect on minorities and lower-income households. Restricting multi-family housing disproportionately affects minority households as approximately 48% of minority households in Boston have children compared to 32% of white households. Furthermore, lower-density, single-family housing is more expensive than higher-density multi-family housing, which effectively limits the ability of low- and moderate-income households to afford housing in affluent high opportunity suburban communities. 0 units with four or more bedrooms.